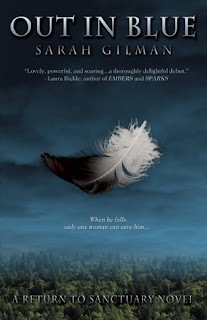 In a violent world where fallen archangels are hunted for their valuable plumage, Wren knows one thing for certain: the human woman who saved him from a poacher attack will die if she stays with him. The demon responsible for his parents' gruesome deaths two decades ago pines for the chance to rip apart any woman who stands under Wren's wing. Wren doesn't expect Ginger to stay by his side once she discovers his ability to drain life with a mere touch, yet she lingers. When an unusual talent of her own reveals the location of Wren's father, Wren's isolated world implodes. With the help of the demon protectors he's sworn never to trust again, Wren risks everything to rescue his father, confront the demon who stalks his and Ginger's every step, and claim his eternity with the most courageous woman he's ever known. A truly unique story of angels and demons where the concept of good versus evil is turned upside down. The world Gilman has created in Out in Blue, blew me away! In this world demons are the guardians of fallen archangels, protecting them from poachers hunting them to strip them of their wings. Wren is the half human, half archangel, son of Raphael. Ginger is a human that was raised by demon guardian, Devin, after being orphaned. When she overhears a conversation between the poachers that are hunting Wren, she takes it upon herself to warn him, thus twining their lives and fates together. In one of several twists in the story, a demon spirit that only Ginger can see leads her to Raphael. Wren has thought his parents were dead for over 18 years, but Raphael has been held captive and tortured all those years; stripped of his wings every 6 months. Ginger as well learns that she herself has some talents that a mere human should not have. The story flowed well from beginning to end and the world that Gilman created was described through vivid imagery and perfectly flawed characters. My only complaint would be the awkwardly immediate “mating” of Wren and Ginger. Written and read as confident adults throughout, they turn into bumbling teenagers whenever they are intimate. I think perhaps Gilman was trying to capture the “I feel like a teenager again” aspect of their relationship, but it didn’t quite gel for me. Overall I thoroughly enjoyed this unique new world Gilman has created, the Epilogue left me utterly intrigued and anxious for the next installment in this series. I give this one 4/5, but that’s just my two cents!! 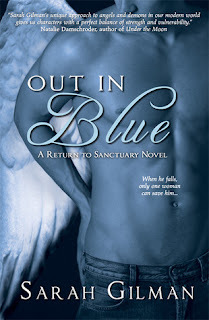 The re-vamped cover for Out in Blue, a Return to Sanctuary Novel.. Humans and archangels don’t mix on the best occasions. When Saffron Morin goes to the gates of the demon colony, Eden, in search of her sister, she meets an archangel who is curious one minute and hostile the next, and she ends up the colony’s “guest” against her will. Kestrel’s archangel psychic talent tells him the human woman’s life is in danger. 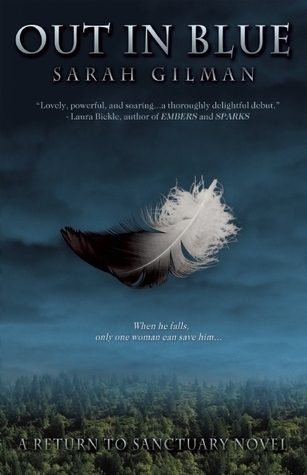 Despite her family’s association with poachers who hunt archangels for their valuable feathers, he vows to save her life. Enemies by birth, lovers by choice, they give in to growing attraction as days pass. Even if he succeeds in saving her life, he must hurt her to protect others of his kind, and he may not be able to live with himself after a betrayal he has no choice but to commit. In order to find redemption, the Collector’s daughter and an archangel must first find each other. Kidnapped by humans as a child, raised in a research facility and taught to believe that all demons and fallen archangels are insidious and violent, Jett wants nothing to do with his own kind. But a friendship with the archangel Raphael shatters Jett’s reality to pieces. Caught between two worlds, he lingers on the fringes of Sanctuary. When a demon child is taken from the colony, though, Jett must pursue the human kidnappers, realizing along the way they are from the same prison where he spent his childhood. Jett joins forces with the Guardians and a civilian demon female—the kidnapped child’s older sister, Lexine. Lexine, meanwhile, is fighting internal demons of her own: prophetic dreams that foretell that she’ll mate with a poacher. All the recent vision entails, though, is a tattoo, an exact replica the one Jett unsuccessfully tried to scrap from his skin. Now, Lexine and Jett must each overcome their fears of the past and the future, in order to save life as they know it. Oh holy wow...hello angel boys...jeanclaudGoddamn!! !